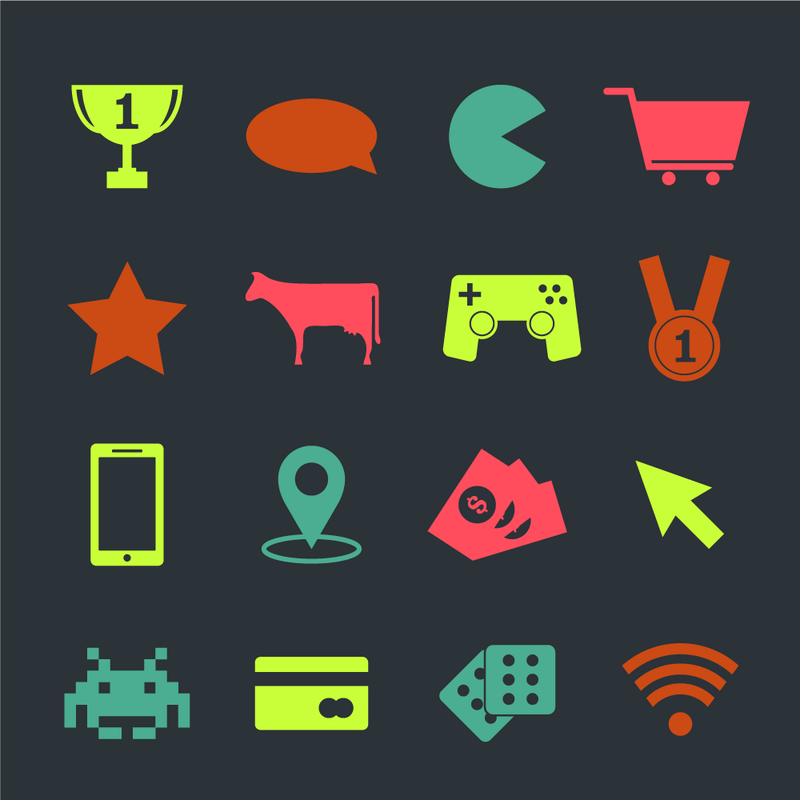 Gamification is used in marketing to engage consumers and sometimes serve addiction. Game mechanics, which normally show progress and give rewards in a game, can be —and are— used to steer consumers into being more invested in products. Akerman (2012) states that gamification is using techniques and methods designed to make games engaging and often addictive in non-game projects. These projects could be based on services, products or campaigns. He continues to outline a few problems with the thinking that you could have people perform simple tasks to unlock badges, win prizes or get points; The tasks done range from ‘liking’, ‘sharing’ or other simple “click this button” to “get this reward” to more comprehensive tasks. This will not work if the mechanics are only applied to the top-level, for the gamification to work as intended it needs to be a deeper part of the structure, like Foursquare (including Swarm) and Waze. These two have built the game mechanics to work with their social community and the core elements of their products. 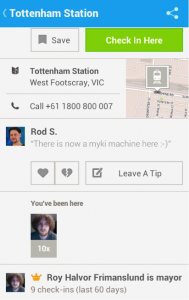 Prince (2013) suggests that the Foursquare app is one of the most successful and known applications of gamification alongside the loyalty program of Starbucks. In the Foursquare app your mission is to check-in at your current location, which will then often result in progress toward some sort of badge*, but also progress toward you being the most active user for that spot; eventually rewarding you badges and the “mayorship” of the spot (Figure 1). Some businesses offer special deals the first time you check-in or they provide an on-going discount for the “mayor”, or any of a number of other types of deal available from the Foursquare deals. The game mechanics are used to get users to share and get information about spots they visit or might want to visit. *!Note that as part of Foursquare splitting its services into two apps (Foursquare and Swarm), the badges and some other gamification elements where removed from its concepts. 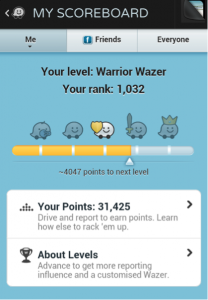 Waze is a crowd sourced and crowd updated GPS application for anyone driving in the traffic. 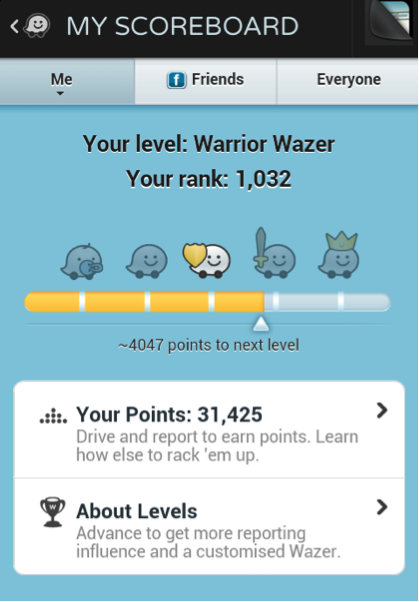 The users are rewarded with points (Figure 2) whenever they drive a route using the app. When the user reports gas-prices, changes in the roads structure, dangers along the road and any other of various types of reports they receive bonus points. While they get these points they also in the same process help the volunteer users that update and creates the maps. The game mechanics are used as incentives for people to engage and help making the system and its database of information better. Danforth (cited in Prince 2013) asserts that games and gamified applications should take the player into an alternate universe and uses Foursquare as a good example of this as the user (or player) could both be the customer and at the same time they can become mayor of the spot in the Foursquare universe. This comes up as a good description when talking about gamification that do not work at all, which is when it is not fun anymore; In a Foursquare blog post about the Swarm app, it is explained that their users did not feel the badges to be special anymore, resulting in their (badges) removal. Furthermore, gamification is still something that needs experimentation to figure out what will work and what will result in failure. Brands, education and workplaces could all be fun if there is a level of gamification carefully applied. This is described (Werbach and Hunter 2012) as possible solutions to differentiate a scenario from all the other similar ones. This suggests that gamification could be the solution for just about anything that seems to be boring? Werbach and Hunter points out some really important problems with gamification, one of these problems is when gamification becomes addictive yet pointless. 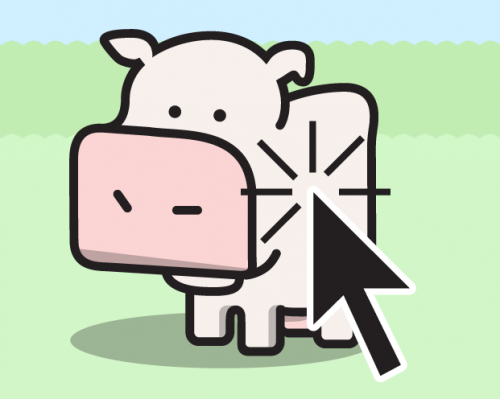 The game mechanics are overplayed and other aspects are non-existent, as with their example of Cow Clicker, a project created as a parody of gamification, but instead went viral. The point of Cow Clicker is to repeatedly click the image of a cow to earn fictional cash called “mooney” that could be used to upgrade the cow. Cow Clicker might have been too well designed for it to be left alone, as the parody point it was supposed to be. Instead it became addictive for its users. The pitfall here is that the gamification aspect of rewards are overplayed and the actual experience are not designed and worked out carefully enough. This could imply that for gamification to work well it needs to take more than just one of the key elements of gamification as shown in figure 3 into consideration so that the game dynamics cover more than only the rewards. In the future, will game companies compete against consumer brands in creating fun or will some game companies merge with brand consultancies? Gamification in marketing and branding still needs to be thoroughly experimented and researched, as it is still easy to fail when adapting game mechanics to other scenarios. However, game mechanics prove to work when executed well and used as a component of concepts as a whole and not only at its surface. Akerman I, 2012, Making gamification work for brands, Campaign Middle East. Blohm I & Leimeister JM, 2013, Gamification: Design of it-based enhancing services for motivational support and behavioral change, Business & Information Systems Engineering, vol. 5, no. 4, pp. 275-278, Springer Fachmedien. Foursquare, 2014, Mayorships and more: How Swarm is going to make your experiences more fun and playful, The Foursquare Blog. Prince JD, 2013, Gamification, Journal of Electronic Resources in Medical Libraries, 2013, vol. 10, no. 3, pp. 162-169, Taylor & Francis Online. Werbach K, Gamification, Coursera courses, Wharton University of Pennsylvania. Werbach K & Hunter D, 2012, For the win: How game thinking can revolutionize your business, Wharton Digital Press. Zichermann G & Linder J, 2010, Game-Based Marketing : Inspire Customer Loyalty Through Rewards, Challenges, and Contests, John Wiley & Sons. Ørstavik M, 2014, Spill deg til bedre motivasjon, Aftenposten.